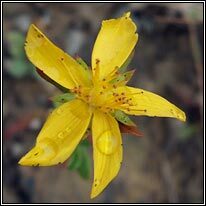 Golden-yellow flowers, black dots on petal edges, pointed sepals. Leaves oblong-elliptic, many transluscent dots are visible when held up to light. Stems round with 2 raised ridges. Hairless. Height: 30-90 cm. Common on grassland, roadsides, hedge banks, scrubland. 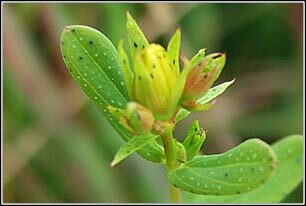 Often grows on drier, neutral or more calcareous ground than Imperforate St. John's-wort. 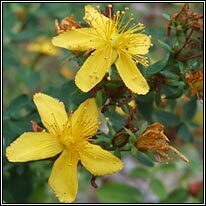 Similar: Imperforate St. John's-wort, H. maculatum. Square un-winged stems, no transluscent leaf spots. Damper ground. 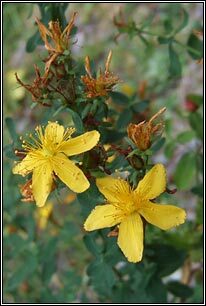 Des Etangs' St. John's-wort, Hypericum x desetangsii.